It is a typical Hindu step well of those times. It was built during the rule of Sultan Mahmud and incurred a havoc cost. It was basically built by Bai Harir Sultani, who was locally called by the name of Dada Hari. It was built in the Asarwa Village close to Ahmedabad. It is 5- storey structure. The depth is for the purpose of extraction of water from deep underground during scarcity times for everyday use. These were very popular during those times due to the lack of modern water holding facility. This has an open roof as soon as you reach the top level and all the levels look just beautiful even though they are now nothing compared to their former glory and grandeur. The pillars and the walls are adorned with fantastic carvings of the traditional Islamic style of designing with a blend of some Hindu essence to it. These wells were specially the place for women who used to perform their daily chores here along with enjoying the coolness inside. These were places used for rituals and occasions also. In those days these kinds of wells served as cool shelters and stopovers of travelers. The nearest airport is the Sardar Vallabbhai Patel airport. The nearest railway station is the Kalupur Railway Station. How popular is Dada Hari Ni Vav? People normally club together Hathee Singh Jain Temple and Swaminarayana Temple while planning their visit to Dada Hari Ni Vav. Very open and majestic antique monument. Temperature is very cool at the bottom and you get to go all the way inside, no restrictions. Beautiful carvings of flowers and humans-an architectural marvel. There is no entry fees to go inside and the place is very well maintained. 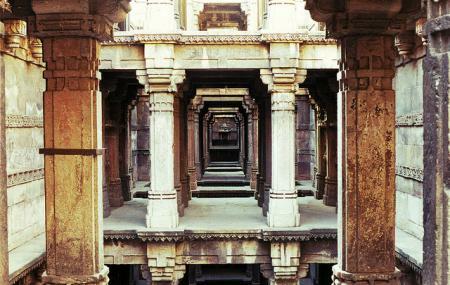 There is a mosque right at the end of the stepwell which is a must visit. An absolute must visit place! Experience is very nice. An architectural wonder with a mix of Persian and Indian styles. Had I not googled, I would've never guessed this is a well. However, this place is dusty and isn't maintained well. Lacks lighting on the lower levels, which are bat infested. Place worth a visit if you like historical place. However, it's not well maintained. And public transport is issue in that area. Beautiful architecture and stone carvings. The surrounding could use a little bit of maintenance but it's worth the visit. Unlike adalaj, it is a lesser know vav and hence its not too crowded and one can easily take good pictures. Carry bottled water and snacks as there are no eatery places nearby. This place is very amazing. I have seen it in few movies. Was fascinated by the view. When we reached the place its not maintained well and there were very less people. But the good thing is its a wonder in itself. Amazing place to wonder and be merry about the architecture which gives a pleasant view. Nothing much to see around but this step well is amazing but if its maintained well it would attract more visitors.